New York City is a place like no other. Inspirational, overwhelming, diverse, cozy; it can take a lifetime to truly understand its unique brand of harmony. Manhattan, one of the five boroughs of New York City, is at the heart of the city; and it does seem to pulse with activity. It certainly has its own appeal in comparison to New York City’s other four boroughs (Queens, The Bronx, Staten Island, and Brooklyn). Manhattan has found its way into the nostalgic subconscious of moviegoers, tourists, and foreigners across the globe. Manhattan has a population of over 1.6 million, all squeezed within a 28 square-mile area (57 sq km), giving it the distinction of being the most densely populated area in America, and one of the best places for buyers looking to own a piece of the Big Apple. It is loosely divided into three regions: downtown, uptown, and midtown, each further divided into individual neighborhoods, from the artsy and eccentric areas of SoHo, Chelsea and TriBeCa, to the wealthy and powerful Upper East Side. Regardless of where on the island people choose to settle, they have to remain versatile and ambitious simply to survive. Those without an active mind and spirit find themselves quickly overcome by a myriad of museums, nightclubs, cafes, and boutiques. Two hundred art galleries are sprinkled across the island, including the Metropolitan Museum of Art, the Whitney Museum, Guggenheim Museum and the Museum of Modern History. Add over 5,000 restaurants of every ethnic background, and 39 entertainment venues, including Broadway and off-Broadway theaters, ballet companies and opera houses, and it’s no wonder the city never sleeps. As home to the United Nations headquarters, the NASDAQ and the New York Stock Exchange, those who live and work in Manhattan make more than anyone else in the country, boasting the highest per capita income in the United States. More than two million people work in Manhattan, making it one of the busiest regions in the world. The hustle and bustle seep into the housing industry as well; Manhattan real estate is a big draw, and this area is home to some of the country’s most valuable real estate. Residential property prices recently surpassed an average of $1,400.000 per condo or co-op. Right now is one of the best times to invest in the city, as prices have not yet appreciated reflecting lower inventory or high sales. Even with a higher cost, interest in Manhattan isn’t likely to diminish anytime soon. Developers and architects have millions of dollars going into the borough on a weekly basis, in the form of renovations and new developments, and it seems everyone wants to connect to the most vibrant city in the world. Of course, not everyone has to be a millionaire to live in Manhattan, nor does the borough cater just to the wealthy. There are plenty of places for all manner of people to live here. The Upper East Side high-rise condos, the Greenwich Village townhouses and the renovated lofts of SoHo and TriBeCa give buyers a variety of choices. Choosing which area of Manhattan to live in is the most difficult decision new buyers have to make. But no matter the final selection, Manhattan guarantees three things: proximity to urban conveniences, cultural diversity, and a blazing sense of community. New York City is full of beauty, both manmade and natural. It lies right in the middle of the paths of three large rivers: the Hudson, Harlem and East Rivers. More than 2,500 acres of greenery is interspersed throughout the city, including the 843 acres called Central Park, where visitors and residents come to walk their dogs, get in shape, bring their kids to play, or just enjoy nature. Historical landmarks such as Ellis Island and The Status of Liberty join forces with cultural hotspots like Chinatown and Little Italy to reflect the great mix of cultures that call New York home. Battery Park City is a premier 92-acre community in lower Manhattan bounded by the West Side Highway on the east, bordering the neighborhood from the financial district of downtown Manhattan. The Hudson River surrounds the northern, southern and western portions. BPC is a mixed-use residential and commercial community constructed during the 1980s. It is made up of five major properties with high tech amenities dotted by kid- and pet-friendly parks in between, interlinked by a 1.2-mile long esplanade alongside the tidal estuary. Park benches lined up the whole stretch, ideal for relaxing after a nice stroll or watching that picture-perfect New York sunset go down. On the northern tip, the North Residential Neighborhood is host to high-rise condominiums and other residential buildings, a large hotel, the Stuyvesant National High School which specializes in mathematics and science, and a mall. The World Financial Center, a multifaceted area of high-rise structures hosts some of the world’s largest corporations, including a mall on the ground floor and second floor. The Winter Garden, a steel-and-glass atrium is the center point of the WFC while a large yacht harbor known as North Cove Marina lies just outside on the Hudson River. Going further south of the WFC is where a majority of BPC’s residential properties are located: Gateway Plaza, Rector Place Residential Neighborhood and the Battery Place Residential Neighborhood. The area is complete with modern facilities and services found on other residential neighborhoods including supermarkets, restaurants, bars, and movie theaters. The Wagner Park on the southern tip of BPC offers a charming respite from the overwhelming “city-ness” of New York City life where one can stroll through gardens of brightly colored flowers. Public restrooms are accessible and there are plenty of stalls open during the day. Carnegie Hill is an Uptown neighborhood within the Upper East Side, bounded by 86th Street on the south, 110th Street on the north, Lexington Avenue and Fifth Avenue (Central Park) on the east and west respectively. This quiet, old-world neighborhood is named after the mansion that steel magnate Carnegie Hill built at Fifth Avenue and 91st Street way back in 1901. The former mansion is now the Cooper-Hewitt National Design Museum. Even today, there are still quite a number of classic and gracious mansions standing in the area but a lot of these have been converted to schools and large apartments such as the Smithers’ Mansion and the French Lyceum on 95th Street between Fifth and Madison Avenue. The neighborhood has a diverse blend of architectural landscape built over two centuries of continuous development, including tall residential apartment complexes, luxurious mansions and large townhouses occupied by opulent families. Even a number of large wooden homes still stand in the area. Carnegie Hill is one of Manhattan’s expensive neighborhoods, not to mention one of the most prestigious. It is known for its family-friendly environment which attracts not only the rich but also the famous. Notable residents include husband & wife Paul Newman and Joanne Woodward, Kevin Kline, Bette Midler and Katie Couric. The suburban atmosphere of Carnegie Hill is evident everywhere you go. Fine dining, gourmet restaurants, bars, lounges and upscale boutiques are easily accessible. Walk the length of Madison Avenue’s northern strip and you’ll find similar stores residing next to each other including various boutiques that sell clothes for children. Carnegie Hill is also home to several schools including Hunter College High School, a secondary school for intellectually gifted students and a private college-preparatory day school for girls. It is also home to the Guggenheim Museum and the Jewish Museum. The total number of households currently living in the Carnegie Hill community is 29,225 while the total number of family households is 10,766 with an average family size of 3.03. The median age of the population is 37.52. An estimated 25,457 males and 30,553 females make up the total population where an estimated 37% graduated from college. On average, the annual household income is $108,825. Central Park South covers the neighborhood of 59th Street from Fifth Avenue on the east to Eight Avenue (Columbus Circle) on the west. As the name implies, the area is located at the southern portion of Central Park and houses several upscale hotels such as the Ritz-Carlton Hotel and the Plaza Hotel. The tallest building in the neighborhood is the 46-floor Park Lane Hotel completed in 1971. Central Park South integrates old world charm in close proximity to modern conveniences as is evident on some of its pre-war apartments that still stands in the area including the Gainsborough Studios which was completed in 1907. CPS also houses several post-war townhouses and apartments that attracts young tenants looking for amenities such as lounges, pools and more such as 220 Central Park South and 24 Central Park South built in 1954 and 1961 respectively. The best thing about living in Central Park South is the spectacular view from above, its close proximity to Central Park and a lifestyle that is utterly convenient. Fine dining, lavish shopping centers and entertainment venues are just a stone’s throw away. Horse-drawn carriages provides a nostalgic experience of bygone New York years and are quite an attraction per se so why not come along and take a stroll? There are an estimated 24,293 households currently living in the neighborhood of Central Park South with a total number of 6,593 family households and an average family size of 2.87. The median age of the population is 38.25 with an estimated 21,201 males and 20,230 females. From this data, 36% are estimated to have graduated from college. On average, the annual household income is $85,428 which is considered above average, compared to the size of Central Park South. Chelsea is located on the West Side, bounded by 14th Street and 34th Street on the south and north end respectively, by Sixth Avenue (Avenue of the Americas) on the east and the Hudson River on the west. The neighborhood is a mix residential-commercial area, an all-in-one has-it-all: magnificent townhouses, exciting night life, shopping, classy art, mouth-watering food, magnificent recreation, luxurious hotels. The neighborhood was named after Chelsea of the Moore family and home to a majority of Manhattan’s creative community. With more than 200 art galleries dotting 20th to 28th Streets, Chelsea has become the art capital of New York. If you’re a fan of the arts, have a visit at the Gagosian Gallery on West 24th, the Matthew Marks Gallery or the Sonnabend on West 22nd. Chelsea Hotel, located at West 23rd Street, between 7th and 8th Avenues is a magnificent landmark per se, former home of William S. Burroughs and made famous by the death of Dylan Thomas in 1953 and Nancy Spungen in 1978. London Terrace, one of the largest apartments in the world in the 1930s runs an entire block from 23rd to 24th Streets west of Ninth Avenue complete with swimming pool, a common garden, gymnasium and 1,700 units. Historic brownstones constructed almost a century ago still lined up the 20th to 22nd Streets in between 9th and 10th Avenues. Above 23rd Street and by the Hudson River, most of the neighborhood is still industrialized. The northern portion of the Chelsea Piers, the city’s main luxury cruise terminal until the 1930s now forms part of an entertainment and sports complex where you can enjoy golf, bowling, skating, batting cages and rock climbing. Kids will enjoy a game of soccer, baseball, gymnastics and a lot more. The Hundon River Esplanade from 59th to the Battery is a great place for biking and roller blading. Go shopping with Barneys Coop, Balenciaga or Comme Des Garcons boutique. The neighborhood is a major route of public transport. The M23 bus goes cross-town on 23rd Street all the way to the Piers while the M11 services the north on 10th Avenue and south on 9th Avenue. The M10 works uptown on 8th Avenue and downtown on 7th Avenue while the subway has stations between 14th to 34th Streets. The total number of households living in Chelsea is an estimated 10,407 while the total number of family households is 2,898 with an average family size of 3.08. The median age is 37.68. There is an estimated population of approximately 10,323 males and 10,268 females in the community where 31% of these are college graduates. On average, annual household income is around $63,772. Located in Uptown Manhattan, East Harlem is bounded by 110th Street on the south, 125th Street on the north, by Fifth Avenue on the west and the East River on the east. The East Harlem neighborhood is a striking mix of apartment buildings and historical places with a rich, diverse population of straight and gay, black and white, South Americans, Asians and Europeans. Come and see the area’s rich history, or marvel at the myriad of modern apartment complexes that costs twenty percent less than their counterpart to the south. As the building boom continues so comes the influx of major commercial establishments. The East River Plaza a $150 million shopping on 116th Street off the Franklin D. Roosevelt Drive will be housing Target’s first Manhattan store above home Depot. A joint venture at 1800 Park Avenue between 124th and 125th streets will include an office and retail center. If you are looking for an outdoor venue to play ball, head on to Thomas Jefferson Park, a 15.524-acre park on 1st Avenue between East 111 and E 114 Streets where you can play baseball, basketball, football or soccer. Treat yourself to fine dining at Orbit on 1st Avenue at East 116th Street where they serve Italian, Latin American and traditional American dishes or hang out at Creole supper club which features live jazz on weekend nights. Major transportation in the area include subway stops at 110th and 116th Streets (6) and 125th Street (4,5,6). The M15 bus services the north on 1st Avenue and south on 2nd Avenue; M100 crosstown to 125th Street; M103 uptown on 3rd Avenue and downtown on Lexington Avenue; M106 goes north on Madison Avenue and south to 5th Avenue while M116 goes crosstown on 116th Street. The total number of households living in East Harlem is an estimated 12,701 while the total number of family household is 7,392 with an average family size of 3.83. The median age is 33.62. There is an estimated population of approximately 19,356 males and 19,428 females in the community, 13% with college diplomas. On average, annual household income is around $21,175. East Village is an extensive neighborhood with a diversity of architectural wonders, vibrant social and cultural backgrounds and rich history. Many of the buildings are beautifully designed tenement-style walkups built during the 1900s at the height of immigrant settlement in New York. Tompkins Square Park, built during the late 1800s and renovated in the 1990s attracts young families, students and tourists from all over with its playgrounds and basketball courts, handball courts and outdoor chessboards. It is also voted as one of the best dog parks in the United States. Venture to Astor Place and have a spin at Tony Rosenthal’s sculpture “Alamo”, known locally as “The Cube.” Check out some of the alternative retailers in St. Mark’s Place from Third Avenue to Avenue A, including Yaffa Café, Crif Dogs and a score of genuine Japanese restaurants and bars, not to mention the record stores that sells rare and competitively priced audio products. Wander to Cooper Square and you’ll find the Cooper Union campus, the Village Voice headquarters as well as New York University class buildings. East Village subway stops include Astor Place (6), Second Avenue (F, V) and 8th Street/NYU (N, R). Bus M9 goes crosstown to the east on 8th and 10th Streets and back to the west on 9th Street. The total number of households living in East Village is an estimated 29,071 while the total number of family household is 6,976 with an average family size of 2.83 The median age is 35.61. There is an estimated population of approximately 26,949 males and 28,581 females in the community where 36% of these are college graduates. On average, annual household income is around $82,678. Downtown Financial District is located on the southernmost section of Manhattan from the West Side Highway to the East River and bounded on the north by Park Place to Vesey Street. 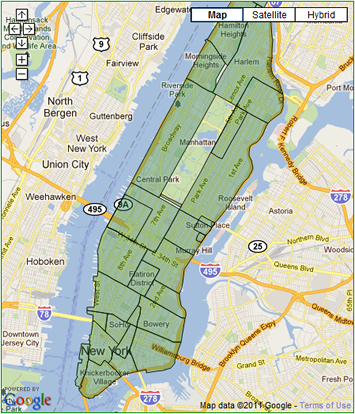 It encompasses roughly the south area of City Hall Park excluding Battery Park and Battery Park City. The corner of Wall Street and Broad Street is considered the heart of the neighborhood. Although the area is fast becoming more residential as more and more apartments are being constructed within the district (such as 3 Hanover Square, 55 Liberty and 150 Nassau) as well as several upscale hotels, Financial District is still primarily a haven of commercial transactions and daytime workers from around Manhattan and the surrounding neighborhoods. If you want to visit FD’s famous attractions, start with the Federal Hall National Monument at the corner of Wall Street and Nassau Street, where George Washington was inaugurated. The historic South Street Seaport located on Fulton Street near East River features some of the oldest architecture in downtown Manhattan not to mention hundreds of cafes, restaurants and shops plus stunning river views. The Financial District also hosts six museums including the Fraunces Tavern Museum with a collection of artifacts from the Colonial period to the mid-19th century. Although Financial District is synonymous with “Wall Street,” the life of the neighborhood doesn’t stop with the closing bell of the New York Stock Exchange. There’s plenty of life after dark in this side of Manhattan including hotel bars, sports bars, restaurants, strip clubs and lounges. Public transport will be the least of your problem as the Downtown Connection offers free bus services and runs from South Street Seaport to Battery Park City. The number of households living in the Financial District area totals 1,383 while the total number of family household is 282 with an average family size of 2.72. The median age is 31.79. There is an estimated population of approximately 1,401 males and 996 females in the community where 33% of these are college graduates. On average, annual household income is around $67,385. Gramercy is in Downtown on the East Side, bounded on the west by Park Avenue South going to the East River, 14th Street on the south and 23rd Street on the north. Gramercy is named after a “crooked” stream or “Crom messie’ in Dutch. It is a quiet neighborhood centered on Gramercy Park, a private park sandwiched between East 20th and East 21st Streets just before Park Avenue South. Only residents who live around the park have a key and the public is only allowed in the park once a year. Here you’ll find 19th-century brownstones and carriage houses still lining the area, although there have been a significant number of high rise apartments and skyscrapers constructed too. The Gramercy Park Hotel, built in 1925 and renovated in 2006 hosts uniqueness and comfort where guests receive keys to the exclusive “secret backyard garden” during their stay. Looking for a place to satisfy your appetite or your craving for a cold beer or hot coffee? Walk along Irving Place day or night and choose from among a mixture of restaurants, bars and other commercial establishments. Japonais on East 18th Street is an upscale fusion restaurant for – you guessed it, Japanese dishes. Enjoy numerous concerts of both famous and independent bands almost every night at Irving Plaza and Irving on East 18th Street. The exclusive residential blocks from 16th Street to Gramercy Park South between Park Avenue South and 3rd Avenue are suggestive of Old English settlements. In fact, East 19th Street between 3rd Avenue and Irving Place is known as “Block Beautiful” because it has a vast number of tenements with unique architecture and unspoiled beauty. Beth Midler’s high school Alma Mater, Washington Irving High School is also on Irving Place. The total number of households living in Gramercy is an estimated 14,987 while the total number of family household is 4,256 with an average family size of 2.79. The median age is 38.75. There is an estimated population of approximately 12,250 males and 14,008 females in the community where 31% of these are college graduates. On average, annual household income is around $87,135. Located in Downtown Central, it is bounded by Houston Street and 14th Street on the south and north respectively, by Bowery on the east and Seventh Avenue on the west. The neighborhood lies south of Flat Iron District and north of SoHo and sandwiched by East and West Village. Oftentimes referred to simply as “The Village,” this cosmopolitan downtown area centers on Washington Square, with a magnificent, dog-friendly park built with a large fountain area and an aesthetic arch built in 1892. If you’re looking for other places to stroll on a lazy Saturday afternoon or escape the tall structures that dominate the surrounding areas, you can wander around the streets of Greenwich Village. This historic neighborhood is known for its outdoor cafes, restaurants and windy European-like pathways. The buildings here allow more sunshine to reach the streets, which offers a calmer and more convenient atmosphere. Walk around and you’ll discover several smaller parks, secret courtyards and small gardens hiding between lavish townhouses in the residential blocks. The Village offers many modern sports conveniences such as “The Cage” on West 4th Street and many other city playgrounds. It also hosts the primary campus of New York University. The uniquely designed, castle-like Jefferson Market Library along the Avenue of the Americas is an excellent place for bookworms. Every year at the end of October, the Village Halloween Parade takes to the streets of Greenwich Village with an audience of millions – the biggest Halloween event in the entire country. Living in The Village also means that you’ll be neighbors to many celebrities including Liv Tyler, Julianne Moore, Jon Stewart, and Uma Thurman. If you see the secret service up and down West 9th Street, don’t be alarmed as this is where former President George W. Bush and daughter Barbara Pierce Bush now resides. The total number of households living in Greenwich Village is an estimated 13,013 while the total number of family household is 4,081 with an average family size of 3.08. The median age is 36.89. There is an estimated population of approximately 12,974 males and 12,879 females in the community where 34% of these are college graduates. On average, annual household income is around $74,612. Located in Uptown Manhattan, Harlem neighbors Hamilton and Morningside Heights on the west side from Manhattan Avenue and St. Nicholas Avenue all the way to the East River from 110th Street on the south to 155th Street on the north. This magnificent neighborhood harbors many architecturally aesthetic edifices ranging from brownstones and historic landmarks to modern condominiums and museums. Residences like the 155-unit Dunbar Apartments on 149th to 150th Streets in Frederick Douglass Boulevard to Adam Clayton Powell Jr. Boulevard, the very unique and southern-style Astor Row between Fifth Avenue and Lenox Avenue, and Striver’s Row on 139th Street between 7th and 8th Avenues are some of the familiar sights you’ll find. Harlem provides an exciting and unique suburban life favored by an array of modern amenities. You can find anything that your heart desires under Fairway Uptown and Citarella. Enjoy shopping with Harlem’s popular retail stores Disney, Old Navy, HMV, Marshall’s Circuit City and many other smaller boutiques. Head on to Apollo Theater at 253 West 125th Street, the most famous club in Harlem for a night of popular music. Transportation includes subway train 2 & 3 servicing Lenox Avenue from 110th Street to 135th Street with train 3 servicing up to 148th Street on Adam Clayton Powell Boulevard; B, C on Frederick Douglass Boulevard from 110th Street to 155th; A on 125th to 145th; and D from 125th to 155th. The total number of households living in Chelsea is an estimated 10,356 while the total number of family household is 5,381 with an average family size of 3.60. The median age is 33.77. There is an estimated population of approximately 11,961 males and 13,841 females in the community where 14% of these are college graduates. On average, annual household income is around $23,570. Inwood is a community located at the northern tip of Upper Manhattan with Dyckman Street bordering the neighborhood from nearby Washington Heights on the south. On the north to the east lies the East River and the Hudson River on the west. The neighborhood offers a calm respite from the busy streets of downtown Manhattan and its surrounding districts and appeals to many who are looking for lower housing costs. The area is known for its woody, rocky parks suitable for hiking and bird-watching. You can come and see waterbirds, raptors and a wide variety of migratory birds stopping by on the last salt marsh in Manhattan. The area also boasts of the last remaining caves in Manhattan, as well as the last remaining colonial farmhouse, known as the Dyckman House. The community is largely a residential neighborhood consisting of apartment houses, parkland, and an area designated as an industrial zone. It is also one of the few remaining places in Manhattan Island where you will still find detached houses as opposed to high-rise apartments, brownstones and townhouses. Broadway is the area’s main local thoroughfare (designated as US 9 at this point) while Henry Hudson Parkway and the Harlem River Drive are its main highway arteries. You can go shopping for clothes, food and other items in the main shopping areas of Dyckman Street, Broadway and West 207th Street. The total number of households living in Inwood is an estimated 14,962 while the total number of family household is 9,314 with an average family size of 3.8. The median age is 33.6. There is an estimated population of approximately 20,070 males and 22,709 females in the community where 18% of these are college graduates. On average, annual household income is around $30,096. Lower East Side on Downtown East is bounded by the Brooklyn Bridge on the south to Houston Street on the north, from the East River to the Bowery. The neighborhood is a bustling real estate center, with apartments, condominiums and other residential complexes under construction. This once poor community is a center of lively Jewish culture as evident in the many shops of Jewish heritage lining Hester and Essex Streets and on Grand Street near Pike. If you’re looking for strictly Kosher delicacies and bakeries, then straight to Grand Street is where you’ll need to go. You’ll also find a few “Kosher-style” delis in Katz’s Delicatessen which opened in 1888 and located at 205 East Houston Street, on the south-west corner of Houston and Ludlow Streets. Nightlife in the Lower East Side is also booming, as the neighborhood gentrified and has become safer to go out at night. Clinton and Ludlow Streets on Rivington Street and Stanton Street provided the nighttime entertainment and can even become a full-pack when the sun goes down including Pianos and the Living Room. Teany, the Delancey Lounge, and Schiller’s Liquor Bar are also popular hangouts. If you’re looking for a residence in this part of Manhattan, you can select from among the many historic walkups, mostly without doormen or visit Grand Street Co-ops for an available apartment space among its 4,500 units. The total number of households living in the Lower East Side is an estimated 31,712 while the total number of family household is 18,423 with an average family size of 3.8. The median age is 37.79. There is an estimated population of approximately 44,796 males and 45,084 females in the community where 19% of these are college graduates. On average, annual household income is around $30,040. Midtown East lies on the East Side, bordered by Fifth Avenue on the west to the East River, bounded by 42nd Street on the south and 57th Street on the north. This area is undoubtedly the busiest single commercial district in the United States. When people talk about Manhattan, the first thing that comes into their mind is most probably the Chrysler Building on Lexington Avenue, which has become an iconic landmark that also sums up the whole of Midtown East. The area contains a lot of energy for commerce and hosts a myriad of other buildings with magnificent architecture. Don’t let your jaw drop when you visit Grand Central Terminal or St. Patrick’s Cathedral across the street from Rockefeller Center, or remember to keep your eyes on the road when you pass by the billion-dollar Time-Warner Center at Columbus Circle. Many of Midtown East residents go about with their shopping at Bloomingdale’s on 1000 3rd Avenue while Central Park provides the needed space for relaxation and unwinding. Classy night owls flock to King Cole Bar at the St. Regis Hotel on East 55th Street, at Fifth Avenue for a night of sumptuous dinner. The total number of households living in Midtown East is an estimated 10,509 while the total number of family household is 2,188 with an average family size of 3.03. The median age is 39.09. There is an estimated population of approximately 10,572 males and 7,764 females in the community where 32% of these are college graduates. On average, annual household income is around $53,735. Clinton is located in Midtown West bounded by Fifth Avenue on the east to the Hudson River on the west from 34th Street to 57th Street; Clinton’s boundary lies from 34th Street to 50th Street from Eighth Avenue to the Hudson River. This former stronghold of poor and working-class Irish-Americans has undergone a major facelift since the former days of the West Side Story and is now home to a diverse number of people of different cultural backgrounds. As a testament, Restaurant Row on West 46th Street between Eight and Ninth Avenues became well known for its many ethnic restaurants serving all sorts of imaginable cuisine, from Afghan dishes to Vietnamese oriental cooking. Midtown West is a transportation hub as every mode of transportation that you can think of has some form of infrastructure in the area including automobiles, ocean-going ships, trains, buses, airplanes, and even horses. Among them includes the Lincoln Tunnel which connects New York City to New Jersey, the huge Port Authority Bus Terminal between 40th and 42nd Streets at Eight and Ninth Avenues. Cruise ships continually dock at the New York Passenger Ship Terminal in Piers 88, 90 and 92. Nearby is a collection of planes on display at the Intrepid Sea-Air-Space Museum featuring the USS Intrepid Aircraft Carrier. Even the horse-drawn carriages of Central Park stay in stables just off the West Side Highway. Every summer, thousands of New Yorkers enjoy the live concert series at Bryant Park happening every Friday morning, featuring some of the best acts in the world. The Bryant Park Summer Film Festival also showcases free outdoor movies every Monday evening. The giant Christmas tree at Rockefeller Center is a sight to behold every winter where you can also go ice skating on the rink below. There is 2,620 total number of households living in the Clinton area while the total number of family household is 746 with an average family size of 3.09. The median age is 34.64. There is an estimated population of approximately 3,055 males and 2,662 females in the community where 31% of these are college graduates. On average, annual household income is around $72,967. Morningside Heights runs from Riverside Drive on the west to Morningside Park on the east, from 110th Street on the south (bordering the Upper West Side) to 125th Streets going up north. The main thoroughfare is Broadway Avenue and is filled with restaurants, cafés, specialty stores, retail outlets and other amenities. The area of Morningside Heights was once known as an academic neighborhood (also referred to as the “Acropolis of New York”) because it is one of the highest natural points in Manhattan and were numerous educational institutions have made this part of Manhattan their home base. Columbia University, Barnard College and Manhattan School of Music are just some of the many academic landmarks found here. Many of the city’s lavish townhouses and apartment buildings dominate the architectural scene most specially the homes along Riverside Drive which offer spectacular views of the Hudson River. High-rise condos, co-ops, the Cathedral of Saint John the Divine, the Riverside Church, and St. Luke’s Hospital also add to the unique architectural landscape of the area. Morningside Heights also houses one of the most famous diners in the world – Tom’s Restaurant on Broadway at West 112th Street which was featured in the song “Tom’s Diner” by one of Barnard College’s alumni, Suzanne Vega and also featured in the television sitcom “Seinfeld” as the daily hangout of the characters in the show. West End Gate, Terrace, Kitchennette Uptown and Pisticci are also famous hangouts of the gastronomically adventurous. The total number of households living in Morningside Heights is an estimated 10,407 while the total number of family household is 2,898 with an average family size of 3.08. The median age is 37.68. There is an estimated population of approximately 10,323 males and 10,268 females in the community where 31% of these are college graduates. On average, annual household income is around $63,772. This Midtown East Side neighborhood runs from 23rd Street (south) to 42nd Street (north) from the East River to Park Avenue South between 23rd and 34th Streets then expands from the East River to Fifth Avenue across 34th and 42nd Streets. Murray Hill was named after the Murray family, 18th-century Quaker merchants who moved to New York in 1753. Living in this part of the city may not be as charming as in other parts of Manhattan but housing here is slightly cheaper compared to its neighbors which many find extremely practical. Majority of the residents are young people in their twenties and thirties, mostly students and the young professionals of New York. Living here is less expensive than in nearby Greenwich Village or SoHo. Most of the cheap but good restaurants are mostly located on the edges of Murray Hill although casual eateries are plentiful. Go straight to Third Avenue for a delightful selection of delis, bars and boutiques. Marvel at the architectural genius of the Morgan Library and Sniffen Court carriage houses on 36th Street. Need to reach Murray Hill fast? No problem. Lexington lines 5 and 6 stops at Park Avenue while line 4 makes an express stop at Grand Central. Line 7 services 42nd Street along the northern boundary which brings Queens residents to the neighborhood in ten minutes from Astoria. Bus M16 and 104 goes crosstown servicing 34th Street and 42nd Street. The total number of households living in Murray Hill is an estimated 31,011 while the total number of family household is 7,917 with an average family size of 2.75. The median age is 37.09. There is an estimated population of approximately 25,371 males and 28,996 females in the community where 38% of these are college graduates. On average, annual household income is around $86,193. A Downtown neighborhood bounded on the north by Houston Street and on the south by Canal Street. On the east side, it is bordered by Lafayette Street and on the west, the Hudson River. This historic district is noted for the complex cast-iron buildings most of which were constructed in the late 19th century were many were originally used as warehouses and factories. These notable structures are now knockout lofts which house some of SoHo’s creative community including artists and fashion designers who can afford to live high above the shopping crowds. If you are looking for new condos and luxury apartments, then head west towards the Hudson River. The district’s charming cobblestone streets which mostly have been recently repaved, together with an assortment of designer boutiques such as Chanel, Marc Jacobs and Prada attracts quite a crowd especially on weekends and during holidays. But SoHo is not only famous for its array of boutiques that carry major labels, but its many restaurants and sidewalk vendors also offer quite a treat for choosy shoppers. Check out Mercer Kitchen and Fiamma Osteria on 206 Spring Street between Sullivan Street and 6th Avenue, where you’ll frequently find celebrities. Balthazar offers extraordinary French cuisine, The Cub Room serves fine American dining while Dos Caminos Soho offers you a taste of modern Mexican cooking. Getting there is the least of your worries as subway trains A,C,E services Canal Street (C,E to Spring Street), trains 1,2,3 stops at Houston and Canal Streets, R,W to Prince Street. Trains N,R,Q,W services Canal Street, 6 to Canal and Spring Streets, J,M,Z to Canal Street. Bus M21 goes cross town on Houston Street, M1 and M6 services south on Broadway with M1 going back north on Lafayette and the M6 on 6th Avenue. The M20 bus goes uptown on Hudson Street and downtown on Varick Street. The total number of households living in SoHo is an estimated 10,894 while the total number of family household is 5,477 with an average family size of 3.30. The median age is 39.32. There is an estimated population of approximately 13,921 males and 13,054 females in the community where 28% of these are college graduates. On average, annual household income is around $93,605. Sutton Place is a charming little neighborhood that borders the East River to Second Avenue on the west and 52nd and 59th Streets on the south and north respectively. It is a quiet and fashionable little place per se, things you would not expect in the midst of the hustle and bustle of midtown Manhattan. The area covers two public parks, one at 57th Street and another at 53rd Street, jogging along the East River and a dog run. The neighborhood is considered as one of the city’s most attractive and prominent residential addresses. It was named after shipping magnate Effington B. Sutton who bought the land along the river. On 58th Street, you will find a row of gorgeous co-ops and townhouses while Sutton Place per se houses several beautifully designed apartment buildings with an unobstructed view of the East River. The UN Secretary-General has its official residence in a four-story townhouse in Sutton Place, formerly owned by Anne Morgan and donated to the United Nations as a gift in 1972. If open park spaces are not your type of hangout, you can head on to Sutton Place Bar and Restaurant at 1015 Second Avenue between 53rd and 54th Streets, a hot spot with four full bars where you can have a few drinks, listen to music or watch your favorite sporting events. The Terrace is an outdoor rooftop patio where you can have a nice drink outdoors. The total number of households living in Sutton Area is an estimated 19,731 while the total number of family household is 6,205 with an average family size of 2.66. The median age is 45.87. There is an estimated population of approximately 14,697 males and 17,292 females in the community where 41% of these are college graduates. On average, annual household income is around $128,964. Tribeca stands for “Triangle Below Canal” which refers to the downtown area that runs west from Lafayette Street to the Hudson River on the north of Battery Park City. The neighborhood is bordered by Canal Street from north to east, Park Place and City Hall on the south and by the Hudson River on the west. Tribeca is home to cobblestone streets, fantastic restaurants, and pre-war warehouse buildings which have now been converted into luxury condos and apartments. The neighborhood is one of the most expensive zip codes in the U.S. (10013), not to mention one of the most appealing. This charming little neighborhood north of the Financial District offers pricey but great living. It has first-class eats, bars and other amenities. Cross the West Side Highway and enjoy the astonishing Hudson River Park where you can stroll along the promenade or simply watch the sunset kiss the horizon. Catch the Tribeca Film Festival every spring which draws moviemakers and film buffs from around the world. You can also get a superb Mediterranean meal at Tribeca Grill, not to mention a glimpse of celebrities. Nobu is one sushi restaurant you shouldn’t miss – try their cod in miso sauce and you’ll forget you’re in Manhattan. Dylan Prime serves excellent steak for that fine American dining. With its close proximity to the Financial District, getting to Tribeca is no hassle. Subway trains 1 and 9 stop at Canal Street, Franklin or Chambers Streets. The 2 and 3 express trains stop only at Chambers while the A, C and E lines stop at Canal Street near West Broadway. The east side 6 train stops at Canal and Broadway. The M20 bus will take you uptown on Hudson Street and downtown on Seventh Avenue/Varick Street while M6 will take you uptown through 6th Avenue. The M22 services cross-town at Chambers Street. The total number of households living in Tribeca is an estimated 1,969 while the total number of family household is 908 with an average family size of 3.13. The median age is 35.67. There is an estimated population of approximately 3,274 males and 2,226 females in the community where 32% of these are college graduates. On average, annual household income is around $133,300. Located on the Upper East, bordered by 57th Street on the south and 110th Street on the north; bounded by te East River and Fifth Avenue on the west. The neighborhood encompasses the enclaves of Sutton Place and Carnegie Hill. Upper East Side is home to world-famous museums, exclusive schools and luxury boutiques, not to mention its proximity to the most well-known park in the world – Central Park. This family-oriented district is home to some of Manhattan’s rich and famous but it also has a neighborhood where living is surprisingly affordable. In the Upper Eastside, there’s something for everyone. Mansions and huge pre wars lined up Fifth to Park Avenues with spectacular views of Central Park, immediacy to expensive dining, shopping and the best private schools in the city – basic necessities for the seriously wealthy. There are also studios, one- or two-bedrooms condominiums and rentals as well. The area east of Lexington Avenue offers surprisingly affordable residential conversions (prewar and postwar co-ops, condos and mid-block townhouses) than west of Lexington. The farther east you go the more affordable residential enclaves are, until you get to East End Avenue where the river view sends residential value soaring up again. The Upper East Side is served by the IRT Lexington Avenue Line 4,5,6 as well as local bus routes. Expect traffic decongestion once the Second Avenue Subway which will run from 96th Street to 63rd Street is finished. The total number of households living in the Upper East Side is an estimated 26,519 while the total number of family household is 9,173 with an average family size of 2.97. The median age is 39.05. There is an estimated population of approximately 21,506 males and 26,290 females in the community where 40% of these are college graduates. On average, annual household income is around $114,709. On the west side of Central Park, from 57th Street north up to 110th Street, from Central Park West to the Hudson River. This lovely neighborhood stretch offers a lot of everything, from residential buildings each with their own distinct brand of architectural style to commercial establishments that span a century of tradition. Many residents who live in the Upper West Side work in nearby Midtown and Lower Manhattan districts. Many of them exemplify a liberated culture of a creative population as opposed to the Upper East Side’s more conservative dwellers. Many apartment buildings along Central Park West are some of the most desirable apartments in New York, mainly because of their unobstructed view of the park and their one-of-a-kind architectural design. John Lenon used to live at The Dakota at 72nd Street. Along Broadway, there are several apartment houses of Beaux-Arts architecture while Riverside Drive has many magnificent prewar houses, and north of Columbus Avenue are the homes of post-modern landmark buildings. Upper West Side is also home to several cultural landmarks including the Lincoln Center, the American Museum of Natural History and the 2,800-seat Beacon Theater. The district also hosts scores of public and private schools from preparatory to graduate schools while Amsterdam Avenue from 67th up north to 96th Streets is lined with exquisite restaurants and live music bars. The total number of households living in Upper West Side is an estimated 26,519 while the total number of family household is 9,173 with an average family size of 2.97. The median age is 39.05. There is an estimated population of approximately 21,506 males and 26,290 females in the community where 40% of these are college graduates. On average, annual household income is around $114,709. Washington Heights is located in the northern reaches of Manhattan with Dyckman Street bordering the area from nearby Inwood on the north and 155th Street on the south bordering Hamilton Heights and Harlem. On the east lies the East River while the Hudson River bounds the west side. Historical Washington Heights was named after Fort Washington which was constructed at the highest point on the island. In the late 18th century up to the 19th century, this place was home to well-off New Yorkers. The Morris-Jumel Mansion, located between West 160th and West 162nd Street in the Jumel Terrace Historic District still stands today after 241 years. The neighborhood today is a busy urban area with a lively economy on its own. From shopping to dining, Washington Heights will never run out of amenities. For some time off after a day’s full work, the neighborhood’s five parks provide recreational facilities and offer stunning views and sceneries. Getting to this bustling neighborhood is not a problem. Washington Heights is serviced by subway lines A and C on Eight Avenue with stops from 155th Street to 190th Street. Subway train 1 along the Broadway-Seventh Avenue Line stops at 157th, 168th, 181st and 191st Streets. The total number of households living in Washington Heights is an estimated 18,553 while the total number of family household is 12,039 with an average family size of 3.98. The median age is 34.44. There is an estimated population of approximately 28,485 males and 30,205 females in the community where 34.44% of these are college graduates. On average, annual household income is around $36,227. West Village is bounded by Houston Street on the south end, by 14th Street on the north end, Seventh Avenue on the east side and Hudson River on the west. This downtown community encompasses a distinct cozy character and an old-world charm that living in this neighborhood actually feels like you’re in another European country. It is one of the several remaining areas in Manhattan where you’ll still find 19th-century houses and tree-lined blocks. This trendy neighborhood is characterized by streets uniquely laid out as “off the grid” which can oftentimes be confusing to both tourists and residents alike while 75 Bedford Street has the distinction of being “the narrowest house in the City” at 9.5 feet wide. Classic artist’s lofts such as the Westbeth Artists Community are housed here, along with new residential high rises at 173-176 Perry Street facing the Hudson River. Fashionable boutiques, quaint shops, and nightclubs are located at the Meatpacking District on the west edge of the community. Transportation includes trains A, C and E with subway stations at 14th Street on the Eighth Avenue Line, West 4th Street-Washington Square on the IND Sixth Avenue Line. Trains 1, 2 and 3 stop at 14th Street, Christopher Street-Sheridan Square, and Houston Street. The total number of households living in West Village is an estimated 19,298 while the total number of family household is 4,335 with an average family size of 2.79. The median age is 38.05. There is an estimated population of approximately 16,613 males and 15,578 females in the community where 41% of these are college graduates. On average, annual household income is around $92,995.